Falooda/faluda is a cold and sweet beverage for summer and great for Iftar. Falooda is very refreshing. Traditionally it is made with lots ingredients; here I try to make it simple and easy for home made version to keep it original flavour. You can use or add fruit by your choice, just pick sweet one. Rose essence goes well this recipe, though you can Rooh Afza which will give flavour and colour together. If you don’t have any of these just boil milk with 1 cardamom pod. Thanks. Soak seed tapioca in milk at least 15 minutes. Soak tokma in 1 cup water. Boil the milk till it becomes half. 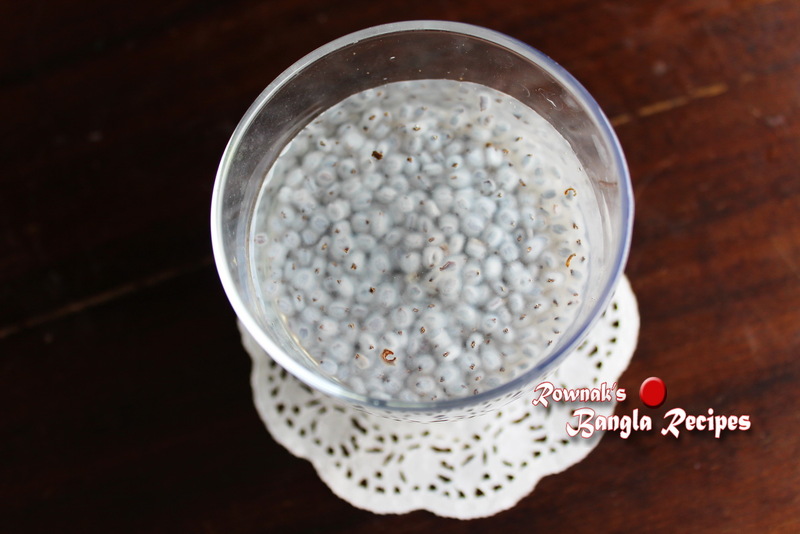 Cook milk till seed tapioca becomes tender and add sugar, food colour and rose essence. When sugar dissolves, remove from heat and let it cool down. Put it into refrigerator. Boil noodles and let it cool down. Put it into refrigerator. Take the serving bowl (I prefer ice cream bowl for Falooda) and first add seed tapioca. Then start layering with noodles, tokma, slied fruit and top up with 1 scoop ice cream. Serve chilled falooda /faluda right away. What is Tukma ? Any bengali or english name?